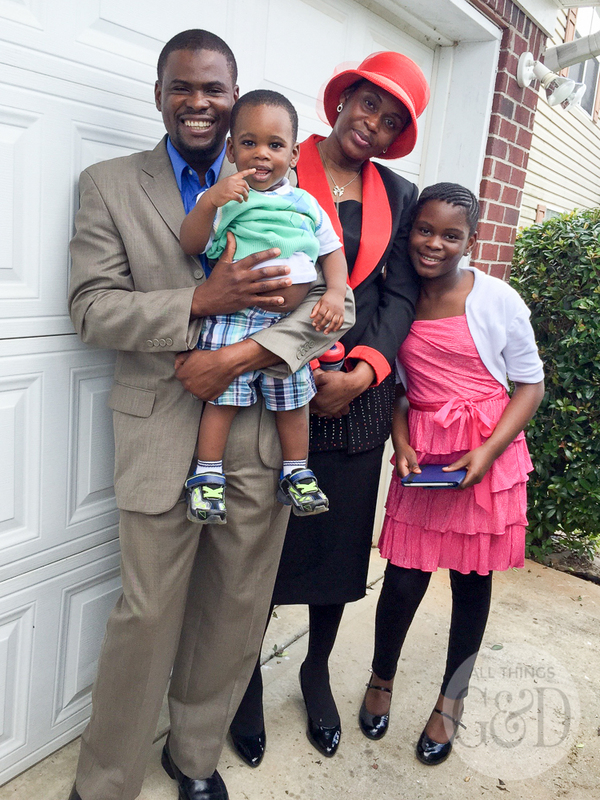 I have wonderful news – the Yaro family closed on their new home last week! 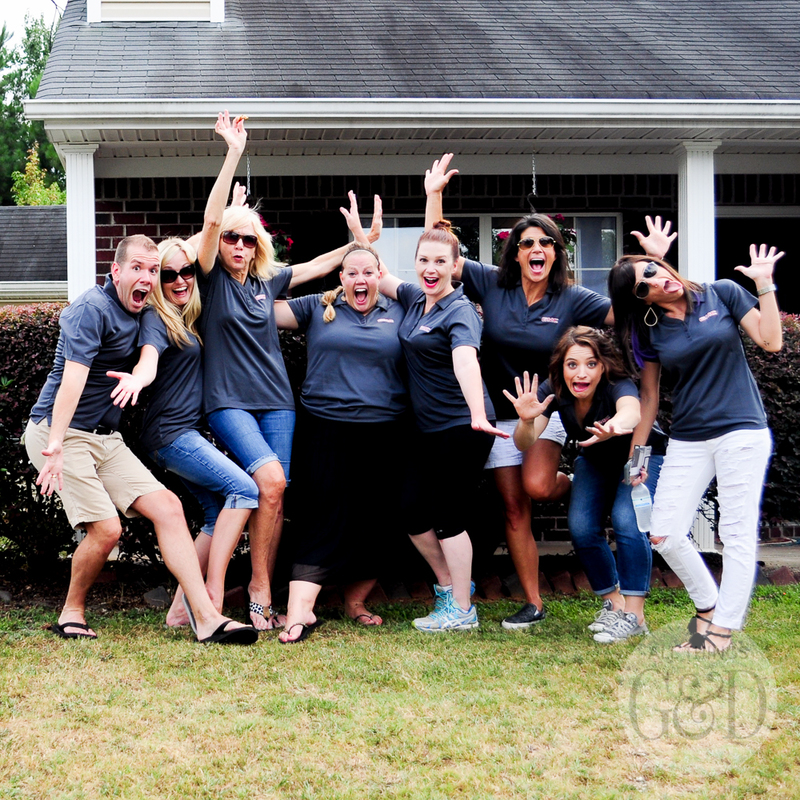 It was such an honor to be a part of this year’s GMC Hidden Treasure Adventure (#GMCHTA), joining GMC and a team of amazingly talented home, DIY and design bloggers. 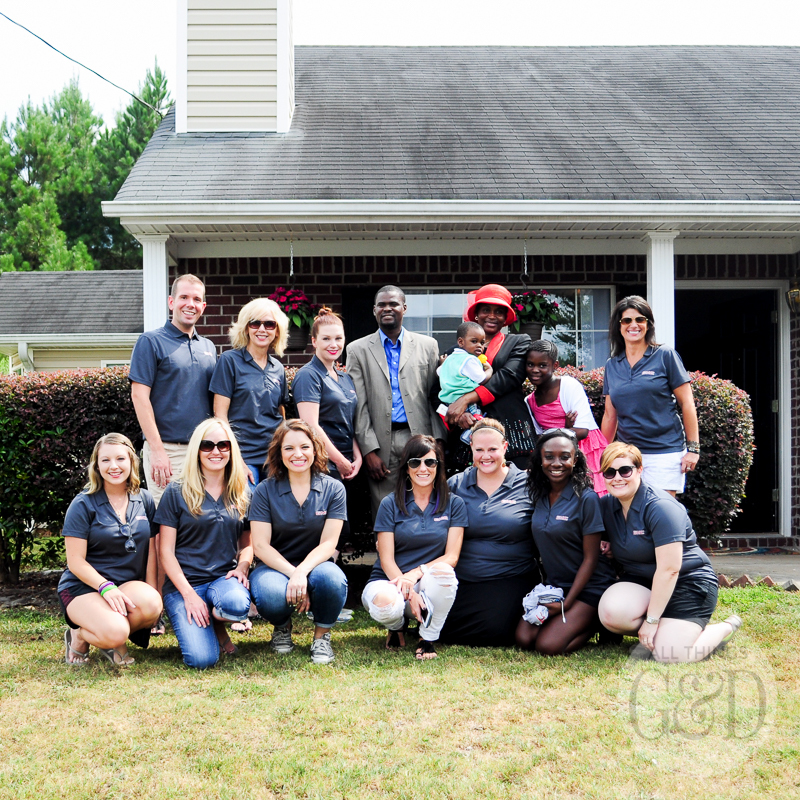 Together we drove across the country in GMC Yukon Denalis, shopping the World’s Longest Yard Sale to fully furnish and decorate the Yaro family’s new Habitat for Humanity home in Atlanta, Georgia. The best part? It was all a surprise! 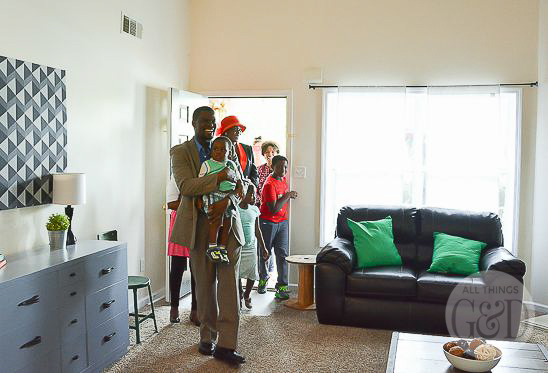 The Yaro family had no idea when they arrived for their final walkthrough with Habitat for Humanity that they’d be opening the door to find their new home fully furnished and decorated. It was such an exciting, joyous, and tear-filled surprise! 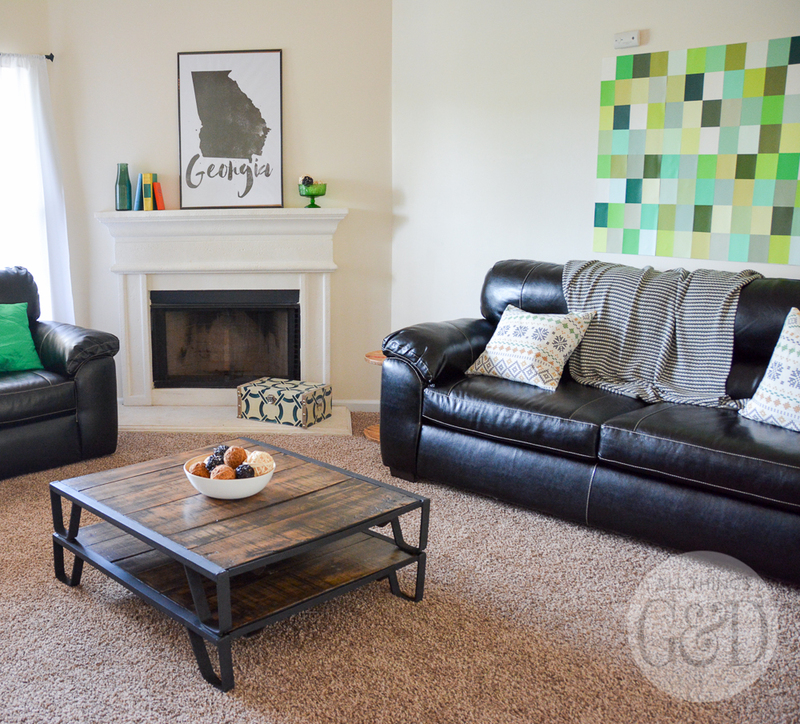 Ashley from Simply Designing was in charge of the Yaro family’s living room and it turned out so beautifully! Ashely was with me during the all-night sanding and painting session at the hotel the night before we surprised the Yaro family, and I’m obsessed with this gorgeous coffee table she created. 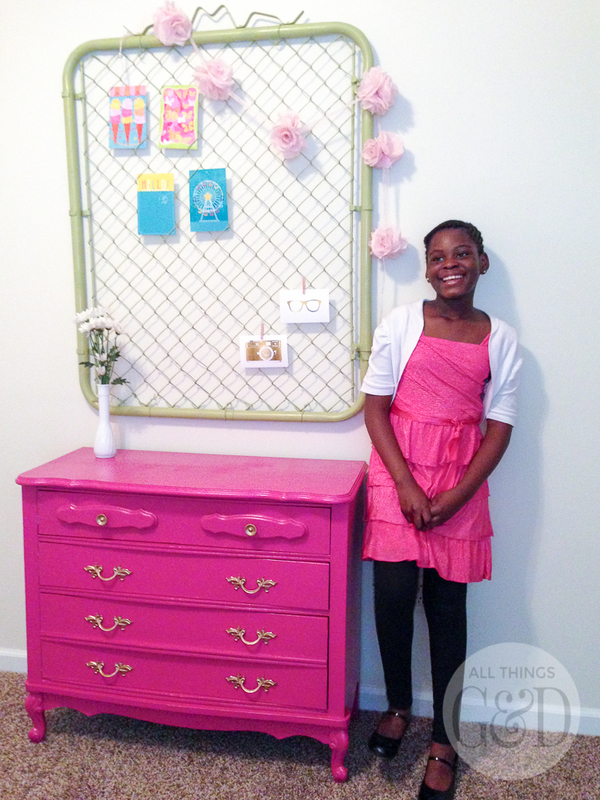 See the entire room and details of Ashley’s design here: Yaro Family’s Living Room Reveal. 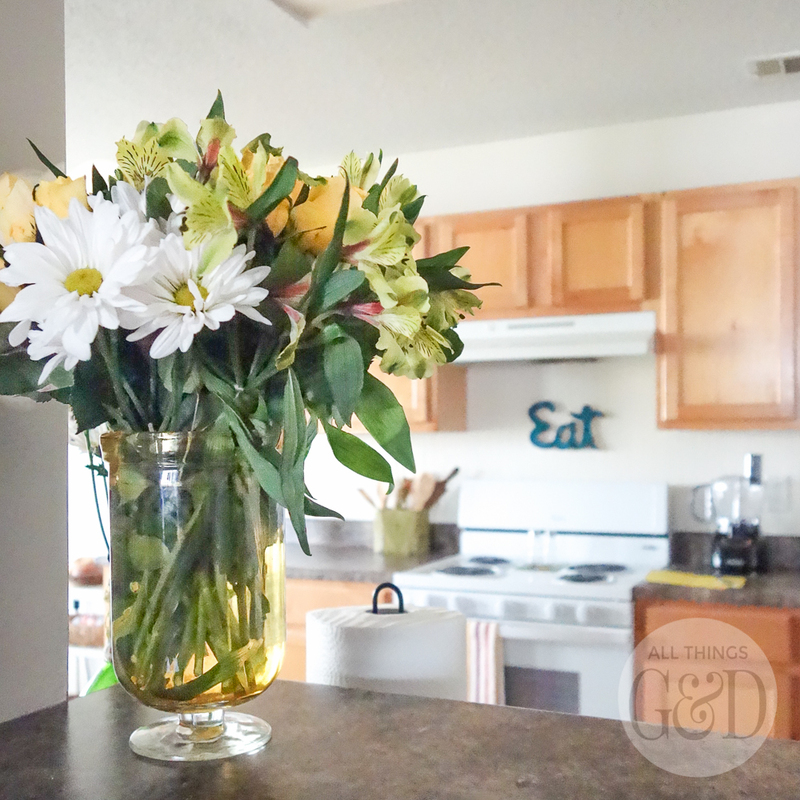 The kitchen was created by Lucy from Lucy’s Inspired and HGTV’s Beach Flip. The majority of her budget went to stocking the kitchen with items for the Yaro family (dishes, small appliances, etc.) but she still brought her fabulous sense of style to the space with some rustic, repurposed, and personalized touches. 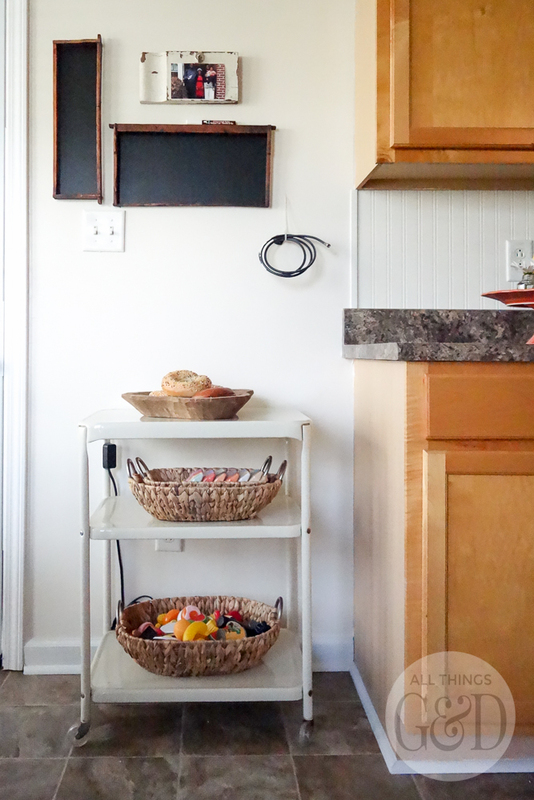 I love the basket of play food she added to the bottom of the kitchen cart for little Elias, and the beautiful faux beadboard backsplash she did above the countertop. 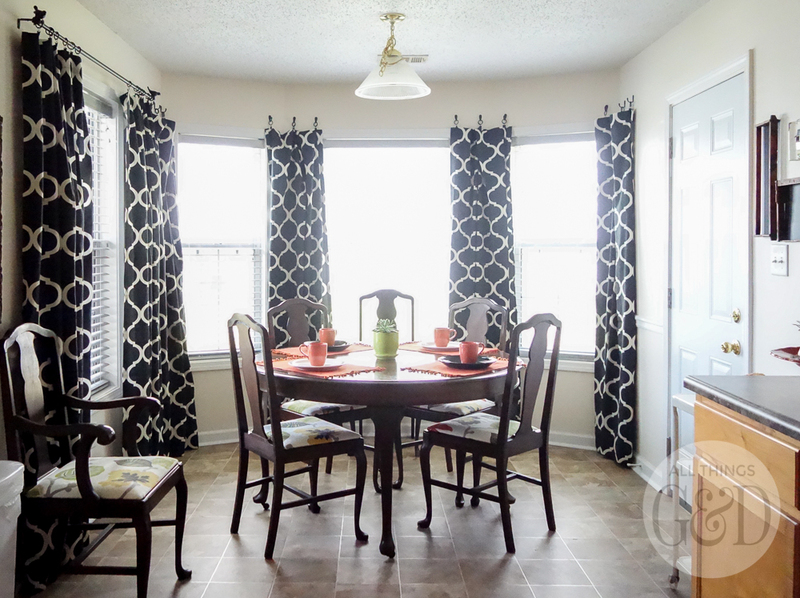 Off the kitchen is the family’s new dining room, created by Rhoda from Southern Hospitality. Rhoda knows how to rock a rummage sale, and she found this beautiful dining table and chairs along the World’s Longest Yard Sale for a steal! My favorite touch in this space are the bold black and white curtains she added to the windows, along with the creative way she hung them around the bay window. 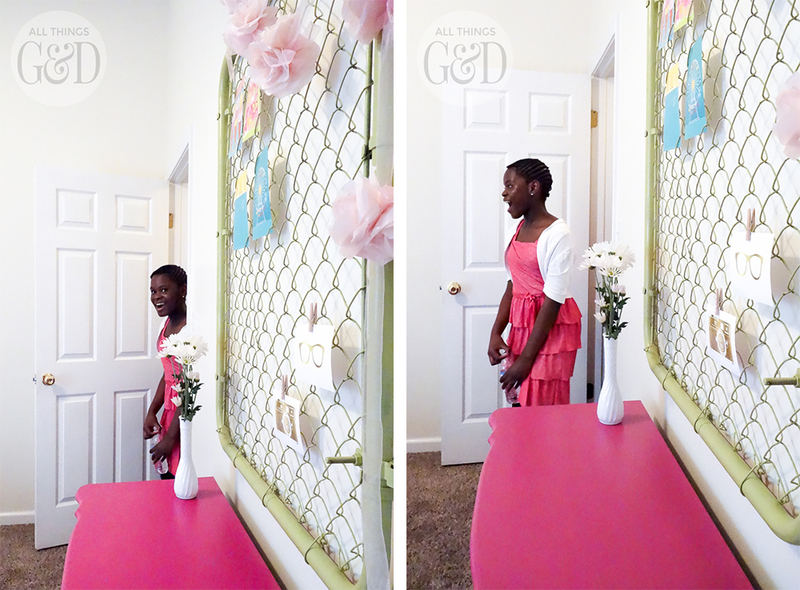 See the entire room and details of Rhoda’s design here: Yaro Family’s Dining Room Reveal. In addition to Yassine’s bedroom, I was also in charge of the hallway bathroom. I had no idea what the bathroom looked like (or how it was laid out) while I was shopping the World’s Longest Yard Sale, but luckily this cute little green and black metal shelf that I found for extra storage fit perfectly. This is the kids’s bathroom and the bathroom guests will use, so I was looking for a playful shower curtain that also wasn’t too childish. I was thrilled to find this one along one of our first stops. The family’s favorite colors are green, blue, orange, black and white, so I knew the rest of the common areas in the home would incorporate these shades, and this bathroom complimented those spaces perfectly. Sarah from Netrs and HGTV’s Beach Flip had a lot of space to fill with the master bedroom and master bathroom, and she did so beautifully. Sarah’s specialty is organization and she purchased and created some wonderful pieces to help keep the Yaro family organized in style. 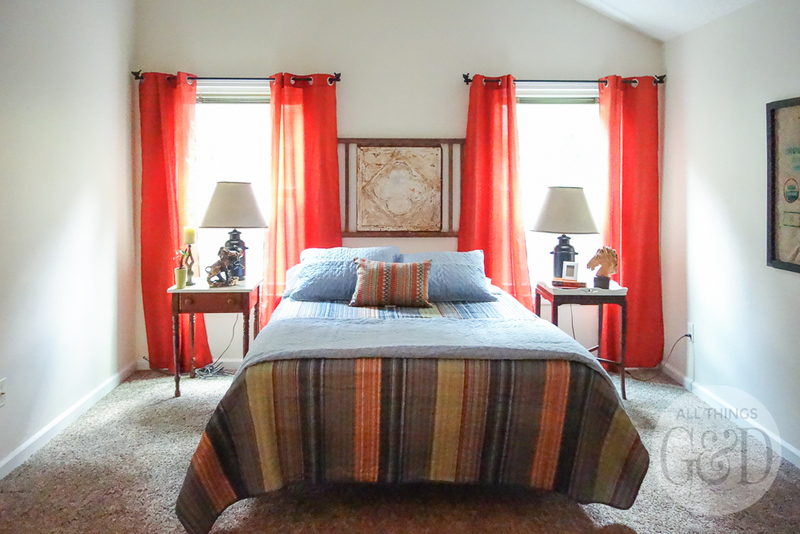 See both rooms and the details of Sarah’s design here: Yaro Family’s Master Bedroom & Master Bathroom Reveals. 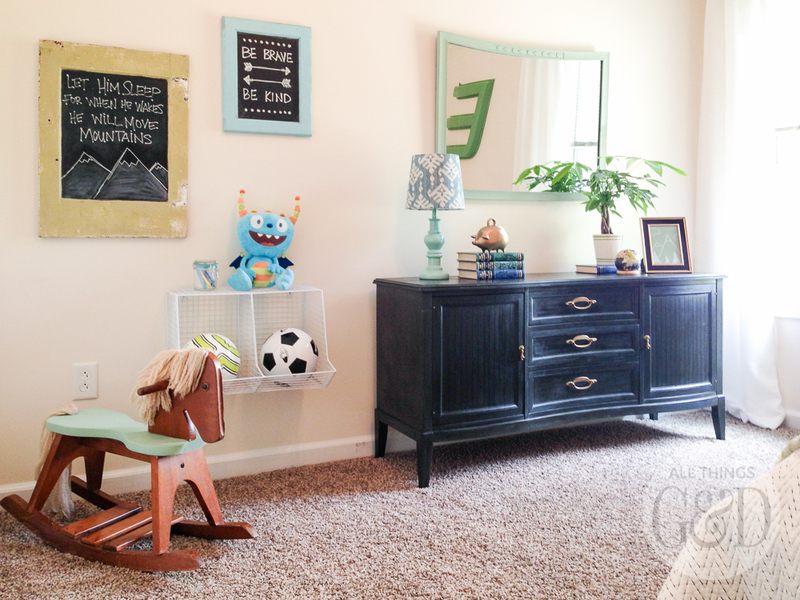 Michael from Inspired by Charm was assigned the little boy’s room and I can hardly handle the cuteness he created for Elias! I had the pleasure of shopping the World’s Longest Yard Sale with Michael so I got to see all of his incredible finds along the way. He did such a great job of finding pieces you would have never guessed came from a yard sale! My favorite is the dark charcoal cabinet he spotted to use for a dresser. It is absolute perfection and goes so beautifully in this space. And his DIY soccer ball artwork? I about fell out when I saw it. It’s brilliant. 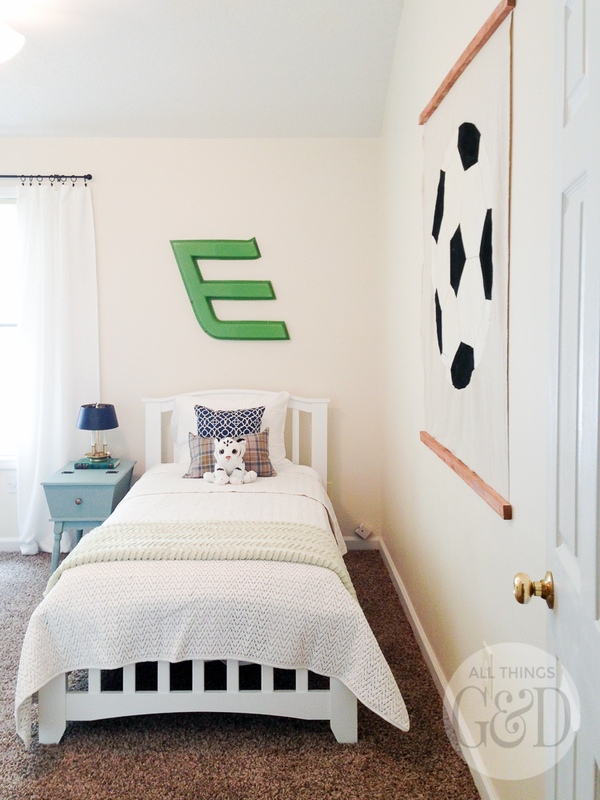 See more of Elias’s bedroom and the details of Michael’s design here: Boy’s Bedroom Reveal. 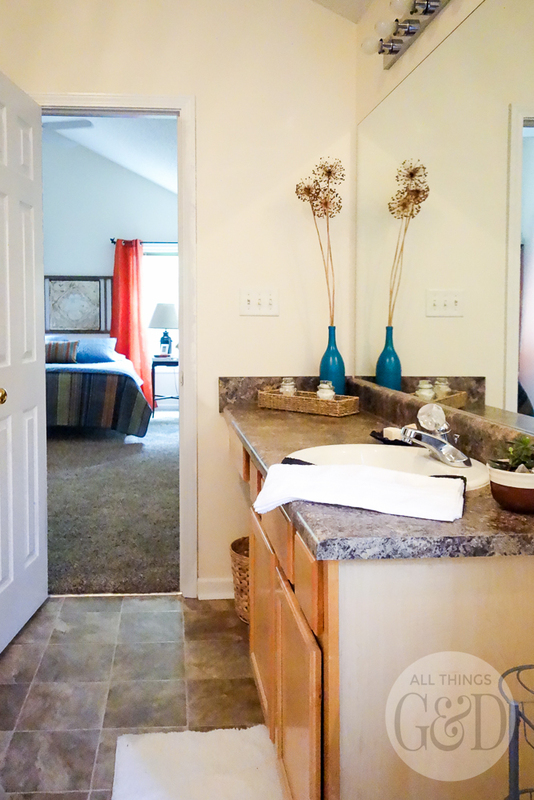 In addition to the boy’s bedroom, Michael was also assigned the laundry room. My favorite design features in this room are that beautiful rug and the neat nail head hooks he found. The rug adds a pretty pop of color, and all those hooks are sure to come in handy on laundry day. 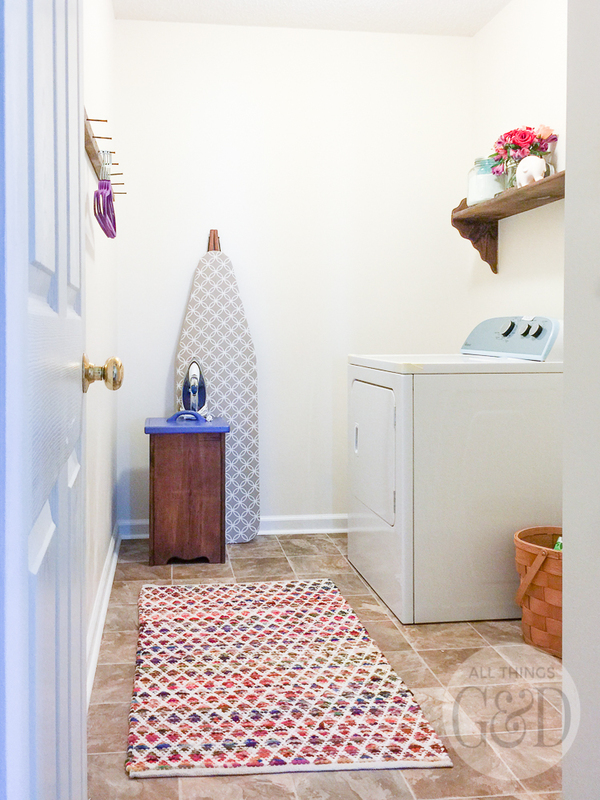 See more of this space and the details of Michael’s design here: Yaro Family Laundry Room Reveal. Another incredibly cool thing about this laundry room is that brand new dryer! A dryer was on the Yaro family’s wish list of things they desperately needed. Brooke from All Things Thrifty and Allison from Two Thirty-Five Designs – our fabulous mentors on this trip – decided to pool their budgets and purchase it for them. Mrs. Yaro’s reaction at seeing their new dryer was one of the highlights of the day! It was such a thrill to see how much she loved it! I was able to shoot a quick Periscope broadcast of Yassine’s room before the family arrived which you can see in the video below. 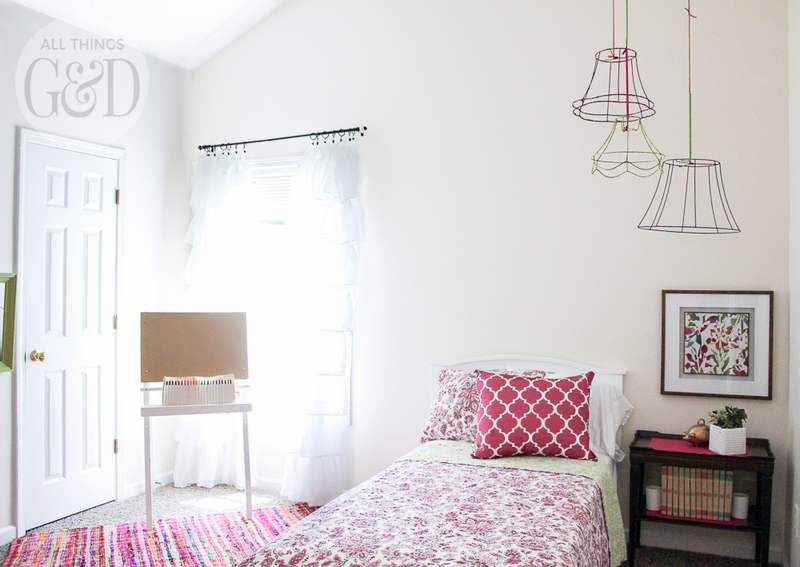 You can also view more of this space and the details of my design here: Yassine’s Room Reveal. It was such a joy to see this beautiful home Habitat for Humanity created for the Yaro family, and truly an honor that we were able to help put the finishing touches on it. Thank you so much to GMC for making it all happen with their Hidden Treasure Adventure – and for including me in on the fun! The gang’s all here! Back Row (L to R): Michael from Inspired by Charm, Rhoda from Southern Hospitality, Me, Mr. Yaro, Mrs. Yaro holding Elias, Yassine Yaro, Lucy from Lucy’s Inspired. Front Row (L to R): Jenn from GMC, Ashley from Simply Designing, Sarah from Nestrs, Allison from Two Thirty-Five Designs, Brooke from All Things Thrifty, Dee from GMC, Megan from GMC. 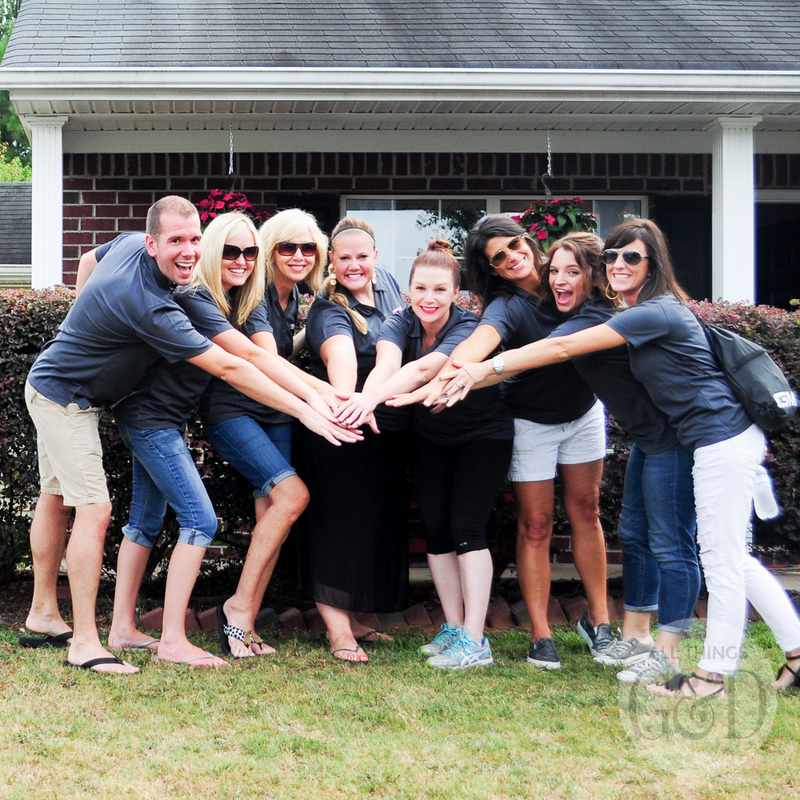 Our entire five day adventure was filled with so much laughter, encouragement, idea-sharing, and support. I cannot get over the massive amounts of TEAMWORK that went into pulling this project off! Oh man, do I love these fun and crazy kids. Yayyyyyyy!!! Love seeing this!! The shower curtain and other things you got from me fit in perfectly with the house!!! Yayyyy! So glad you got a chance to see it, Brooklyne – so fun! 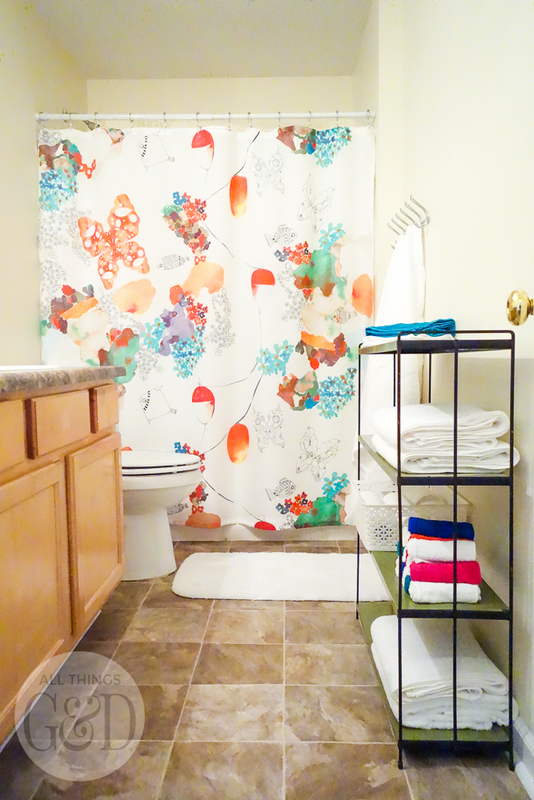 Your old shower curtain was perfect for the Yaro’s home. So glad I met you along the World’s Longest Yard Sale!